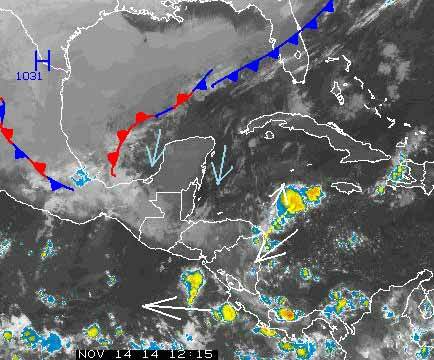 Belize NMS: Mainly fair weather conditions are expected over most areas during the next couple of days. Today: Winds: North 5-15 kts. ; seas: Slight - light chop. ; waves: 1-3 ft.; little or no rainfall. Tomorrow: Winds: N-NE 5-15 kts. ; seas: Light chop. ; waves: 2-3 ft.; few periods of light rain mostly south. Marine Outlook: Saturday night:- winds: NE'ly 5-15 kts. ; seas: Choppy. ; waves: 2-4 ft.; a few brief showers or periods of light rain. General Outlook: Mainly fair weather with little or no rainfall Sat. Then some cloudy spells with a few brief showers or periods of light rain mostly along the coast Sat. night. 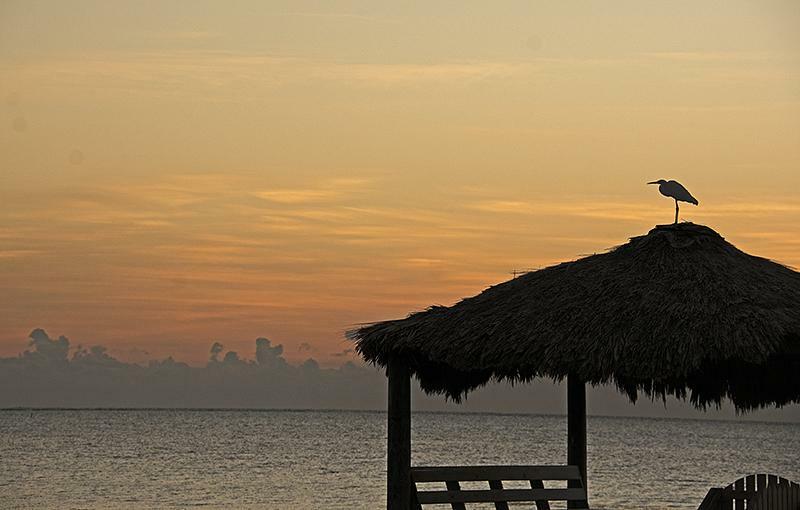 The streak of lovely weather with calm sea and clear sky continues on Ambergris Caye this morning. Our expected high for the day is 86 and this morning it was 73. Just wonderful. Clear skies this morning, actually some high cloud around in parts, but generally sunny. . . . .The cold front is not getting any nearer, but some low level cool air from that mass over the Gulf is coming our way, so today will remain cool, that is the air will remain cool, but it may well feel hot in the sun shine.. . .There is something happening in the Central Caribbean, but not much and will not effect Belize today. So I am expecting similar to yesterday, sunny morning, puffy clouds developing later... No rain.